An original item created for a client. A disc made from beeswax to their specifications. 8" wide and 1/2" thick. Beeswax Disc is not available for sale. This is an example of custom, limited-edition design. This was a brooch designed and constructed for a working group in Canada. It has bur oak leaves, pine and antlers worked into the design as well as a garnett representing the Heart of the forest. Everything was hand sculpted and cast in bronze then given a dark golend red patina. We constructed a bronze pin in back as well as a ring so it may be worn as a pendant. Boreal Heart Brooch is not available for sale. This is an example of custom, limited-edition design. We created this device at the request of a client. Made to hold Sickle or knife which then has a chord attached to it and a circle can be drawn out. Made of solid bronze with a rubberized leather base. Inside there is a steel ball bearing. Circle Turner is not available for sale. This is an example of custom, limited-edition design. A medallion we created following a customers request. 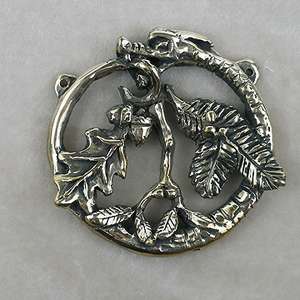 The Oroboros encircles 3 branches, oak, mistletoe and yew, representing the druidic symbol of Arwen. Cast in solid bronze. Custom Medallion is not available for sale. This is an example of custom, limited-edition design. A steel shield with leather strapping. A client gave us several concepts they wanted on the shield. We created the final design and hand painted it in enamel. Eagle Shield is not available for sale. This is an example of custom, limited-edition design. A custom mirror we created as a teaching tool for the non profit "A Day With Ancient Greece". Based on an image in a historic earthenware bowl. Solid bronze mirror size is 6.5" overall size is 9" x 14". 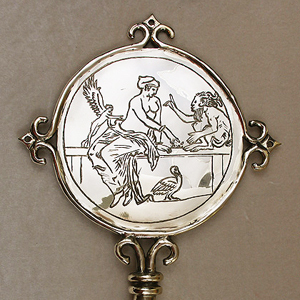 Engraving is Aphrodite playing knucklebones with a Satyr. Engraving is from a mirror cover also from an actual historic piece. Greek Mirror is not available for sale. This is an example of custom, limited-edition design. 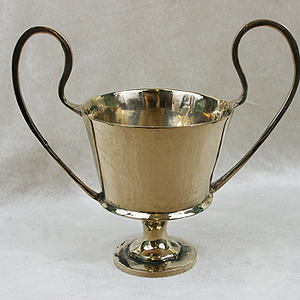 A cup we created based on the ancient Greek Kantharos design. Made of solid bronze, it measures7" across and 6.25" tall. The mouth of the cup is3.5" across. Kantharos Cup is not available for sale. This is an example of custom, limited-edition design. 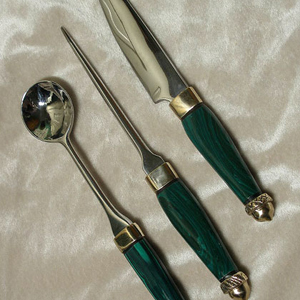 A custom letter opener and matching pen. Made from Blue/black dymondwood. Created for the Royal Manticoran Navy. A set of 4 Marshal Baton's. Solid bronze head with the symbol of a rampant Manticore, it's foot upon a planet. 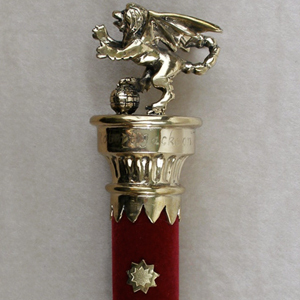 Velvet covered shaft with 26 stars. bronze base with symbol of space helmet and crossed spaceships. An oak case lined in black velvet was created for each Baton. Manticoran Marshal's Baton is not available for sale. This is an example of custom, limited-edition design. We created 3 bronze pipes to be used for mold making of historic clay pipes from the 18th and early 19th centuries. The designs are based on originals from the time period. The company Jas. Townsend and Son will be molding the bronze and creating the clay copies that will then have stems attached. Available for sale at Jas. Townsend and Sons in Spring of 2015. Pipes is not available for sale. This is an example of custom, limited-edition design. Trident is not available for sale. This is an example of custom, limited-edition design. Crown created and designed for the 75th King of the Vulcans, St. Paul Winter Carnival. 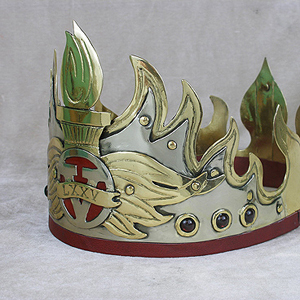 Crown is created from new gold and nickel silver with garnet gemstones and red leather. Vulcan Crown is not available for sale. This is an example of custom, limited-edition design. 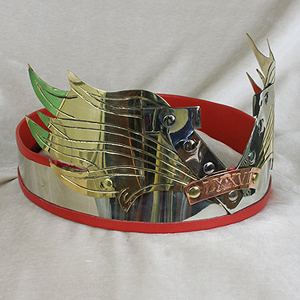 A crown made for the King of the Vulcans during the St. Paul Winter Carnival 2014. Nickel Silver with bronze and copper accents. red Lambskin lining. Vulcan Crown 2014 is not available for sale. This is an example of custom, limited-edition design.